Place and landscape have long been fixtures in the works of TenHornedBeast although they may have been obscured by tracks of cavernous drones and bass heavy shudders that seeped into the dark doom drone that characterised their sound on their earlier Cold Spring albums. Death Has No Companion makes explicit those themes. It's there in the wonderful captivating photography of the desolate uplands of the Pennines on the cover which also carries confirmation of another TenHornedBeast perennial in the quote from Conan the Barbarian author Robert E. Howard. But it is also more apparent in the three lengthy compositions that comprise Death Has No Companion. Epic and expansive are common adjectives used when talking about TenHornedBeast and they could easily be applied here too but on Death Has No Companion Christopher Walton exercises a different facet of the TenHornedBeast which brought us The Sacred Truth and Hunts & Wars. 'The Wanderer' which opens Death Has No Companion to great effect is a beguiling sorrowful lament; a 17-minute track built from layers of mournful electronics furnished with doleful strings. It carries echoes of some of Human Greed's Michael Begg's soundtrack work and especially A Moon That Lights Itself but while that album focussed on a river, this one is grounded on firmer and more desolate terrain. Punctuated by sporadic ringing clatter of rolled cymbals, it is evocative of the wide expanse of moonlit endless fields, open moorlands and rugged hilltops. Thick rolls of heavier tones take it into bleaker, more ominous territory. TenHornedBeast have been here before and I'm thinking here of 'Our Lady Of The Lightning Bolt' from The Sacred Truth but while that track yielded mordant strings they were welded to heavier drones and feedback, 'The Wanderer' is more ambient based and is a beautiful subdued moment from TenHornedBeast. Revolving around repeated heavy reverberating piano chords from which a drone slowly evolves 'Lamentation Of Their Women' is much more sombre. It is a moody piece that gets progressively harsher drawing in grating tones that sweep back and forth. Other sound elements in the form of hissing atmospherics and jolts of frequencies sporadically pierce the arching drones and distant rumbling of the reverberating piano chords, but it never succumbs to the deep dense droning, guitar feedback and bass riffing and overall heaviness of prior TenHornedBeast albums on Cold Spring. At points when aching drones surface it seems the earth is heaving with mammoth cries of grief, yet 'Lamentation Of Their Women' remains restrained within its repetitive structure and like most of Death Has No Companion is rather subdued. 'In Each Of Us A Secret Sorrow' burrows from windswept drone atmospherics and gentle cymbal shimmer into deeper darker tone layers that continue for the remainder of the track which runs just shy of 24-minutes. Once again Walton, foregoes the bombast and doom drone of old, navigating the sound drift with an acute sensitivity. There are moments when the intensity is heightened by the occasional reverberating gong and harsh sound slice but for the most part 'In Each Of Us A Secret Sorrow' remains rooted to a starker more skeletal beast in the form of a minimalist sound. And when he does accentuate the sound with wavering and textured drones which emerge towards the end they sound as if scored on strings. 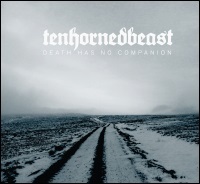 Death Has No Companion may be bleaker than previous releases but there's an emotive strength to be found on and within the musical paths TenHornedBeast traverse here.